The Nigeria Football Federation and Korea Football Association have been overtaken by the Royal Spanish Football Federation in the race for the services of promising Real Madrid midfielder Marvin Olawale Akinlabi Park. Born in Palma de Mallorca, Spain to a Nigerian father and South Korean mother, the attack-minded midfielder is known to be on the radar of the Nigerian Federation but they have been dragging their feet about handing him an invitation to the Flying Eagles. 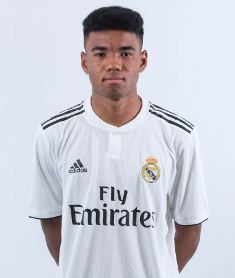 Having shown his qualities in this season's UEFA Youth League, the Spanish Federation invited him to their U19 team team for an international friendly against Italy on Wednesday, January 16. Akinlabi was among five Real Madrid stars named in the squad list by manager Santi Denia , the others being Víctor Chust García, Antonio Blanco Conde, Mohamed Moukhliss Agmir and Miguel Baeza Pérez, for the game against Italy at the Estadio Alberto Pinto in Caserta. He came on for his debut in the 62nd minute as replacement for Miguel Baeza as Spain suffered a 3-0 loss to the Italians. Akinlabi will become provisionally cap-tied to Spain if he gets game time in a 2019 UEFA European Under-19 Championship qualifier against Slovenia on March 20.